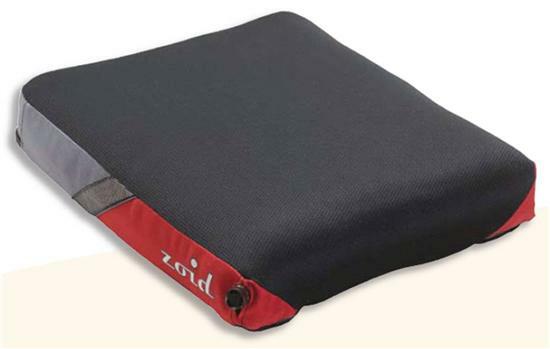 Varilite Zoid Lightweight, Low Profile Tapered Cushion. Athletes value its lightweight design and vibration impact on the court and track. Two types of fabric are bonded to the zoid, two-way stretch knit on the top for maximum conformity and nylon fabric on the bottom for added strength and durability. The cushion cover is a two-way stretch mesh fabric which wraps around the front to eliminate seams. Reticulated foam underneath promotes air and water vapour exchange and improves pressure distribution. 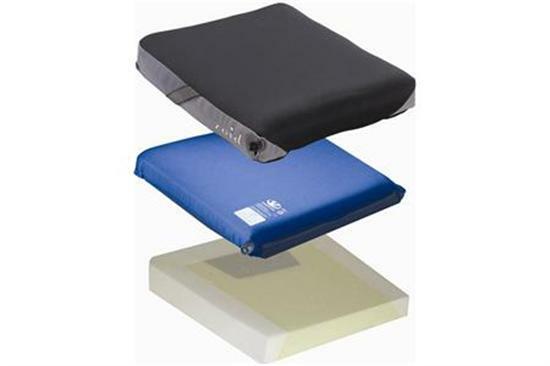 The underside of the cushion is a rugged non slip material with hook and loop for added security. Machine Washable. As air is released from the zoid valve internal pressure decreases and the user is immersed in the cushion for effective pressure distribution. The zoid valve is marked with three pre-set positions, which provide the best range of immersion for most users. Functional areas of the cushion are created by three types of foam: soft form for the decubitus-sensitive area of the ITs; medium foam for main seat support area; and firm foam for the perimeter. Bonding Zoid PSV foam to coated fabric makes the cushion hold air. A valve releases air to immerse the user in the foam, the foam conforms to the user, and the user's weight is distributed over the surface of the cushion. Independent research has shown VARILITE air-foam floatation to be the number one impact and vibration dampening technology (RESNA 2000). Extra-firm, bevelled foam increases lateral stability and sitting balance, while a large ischail pan protects the pelvis in both anterior and posterior pelvic tilt positions. There's no medical thigh seperator, so lower extremeties can drift naturally into midline for better fit in a tapered chair. So, why choose anything else?